Around 461 million tons of construction and demolition waste (hereafter C&DW), excluding excavation materials, are yearly generated in EU28. Recent studies on the characterization of diverse C&DW samples at European level revealed that the predominant material constituent is concrete with an average value of 52%. Over the last years, novel technology has been developed aiming to guarantee high quality recycled concrete aggregates for use in new concrete manufacturing, thereby closing the concrete loop. The most advanced concrete recycling technologies currently produce upgraded coarse (>4mm) recycled concrete aggregates by removing cement paste and fines from the surface of the aggregates. However, the fine (0-4 mm) fraction, accounting for roughly 40% of the recycled concrete, still faces technical barriers to be incorporated into new concrete and consequently, it is often down-cycled. At the other extreme, there are minor (e.g. glass) and emerging (e.g. mineral wool) C&DW materials, currently accounting for 0.7% of the total generation, but revealing growing rates till 2030, as consequence of the European regulations on building energy efficiency and building retrofitting. In global terms, those emerging C&DW streams have not yet found technological and business solutions along with their whole circular supply chain, being mostly landfilled. In addition, there are other uncertainties, for example those related to health regulations, that must be in-depth studied. On the other hand, concrete is the most widely used material in building, with a growing trend towards prefabrication. 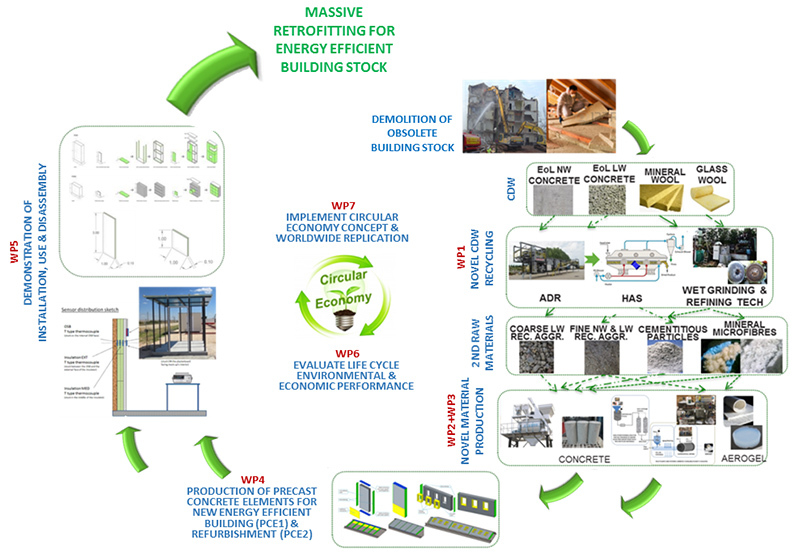 The European precast concrete sector, with annual turnovers around 24 billion € and employing 164,000 people, and its associated supply chain face diverse needs for improvement in resource efficiency (reduction in natural resource consumption and metabolization of waste materials, reduction in both carbon footprint and embodied).